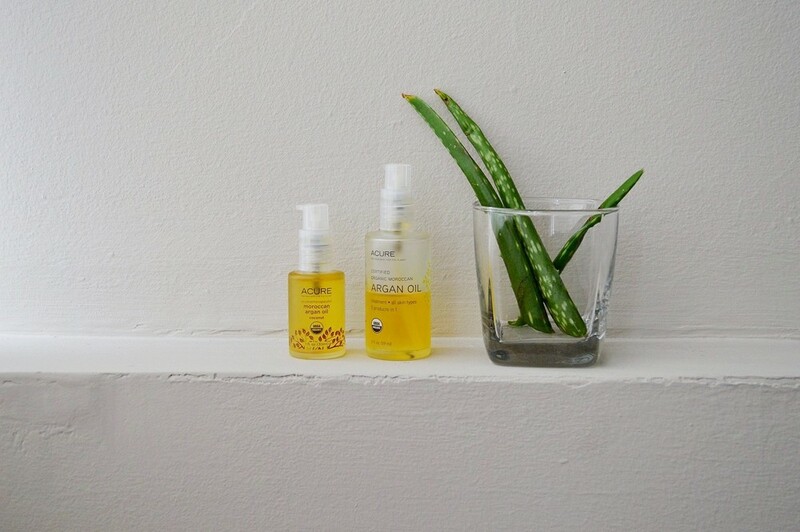 Argan oil and aloe are two things I love to incorporate in my beauty routine. I use argan oil in the morning and evening, for nourishing hydration. I see aloe in a lot of my beauty products, and I often use it alone for extra hydration at night. My most common use of both of these are by themselves as moisturizers. I'll just use a few pumps of argan before bed, or take some aloe from the plant on my desk. But recently I wanted to get creative, and I combined them into a body scrub. The recipe is pretty straight forward, and you can substitute things if you want. You can use whatever salt you want, and you could use almond oil instead of coconut oil. This is just a base recipe, so feel free to change it up. * You can use aloe straight from the plant, but it'll be very messy. I used some from my plant, and the rest was store bought. When you're buying aloe at the store, make sure there are no chemical preservatives! The sea salt gently exfoliates your skin, while the aloe works to heal. The coconut and argan oils are both wonderful for naturally hydrating your skin, while the essential oils provide a little scented pick me up. A simple body scrub that is great for keeping in the shower, as a foot or hand scrub, or even as a gift. What's your favourite DIY body scrub recipe?